Having had my Raspberry Pi for quite some time and played with it extensively at home, (making it read news articles out loud and act as a media server) I’ve long since wanted to try something a little more serious with it involving what we do at work. 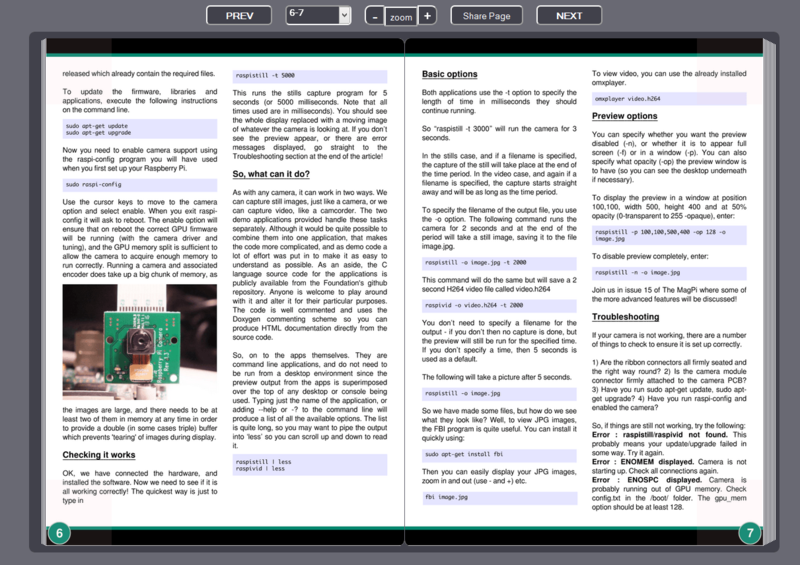 So this week I decided to sit down and get our PDF to HTML5 converter to convert the Raspberry Pi magazine known as the MagPi. (I will be working predominantly on the terminal/command line, but will also be using the GUI from time to time, some of the screenshots will be from both). We will need a PDF file to test the conversion with. If we want to view the file on another device or use some advance features of the program we will also need a local web server or way of access a web server. Not too many steps! Below I detail how I got it all working in turn. into the command line to see if it exists and is installed (you will get an appropriate message). If it does you will need to make sure it’s the Oracle JVM as there are currently some issues in the OpenJDK version on the Pi that cause problems with our library that I discovered during the writing of this article (likely fixed in future versions of the OpenJDK). However as previously mentioned the OpenJDK has some issues that effect our code negatively (and at a difficult to fix low level) that are not an issue in Oracle’s JVM so we will need to install that instead! There are some good guides around on how to just that so I won’t go into a lot of detail and will link to two guides that I referred to when writing this article. Essentially it boils down to what version of Raspbian you are running, if, like me you assumed the OpenJDK would work and are using the normal version of Raspbian (the one that does not use Soft-floating point numbers) than you will need to make use of Oracles Early Access version of Java 8 as it will run on the Raspberry Pi just fine. You can download it here, select the version labelled Linux ARMv6/7 VFP, HardFP ABI. 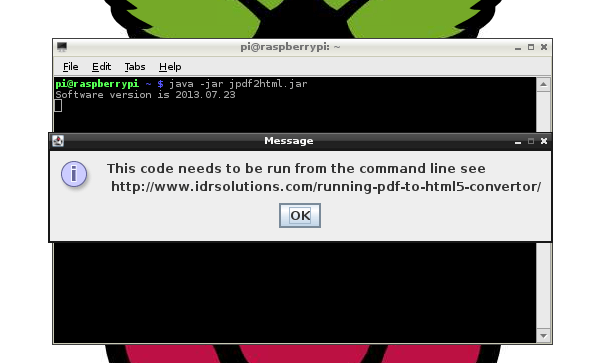 If you are using the Soft-float Debian “wheezy” version of Raspbian you can still make use of the Early Access JDK if you wish or you can use the current version of the Oracle JVM on their website here; click Java Platform (JDK) and scroll down the page and download the version labelled Linux ARM v6/v7 Soft Float ABI. Either way you will end up with a tar.gz file. This file contains the JDK you choose and will need to be unpacked onto the Pi to continue. 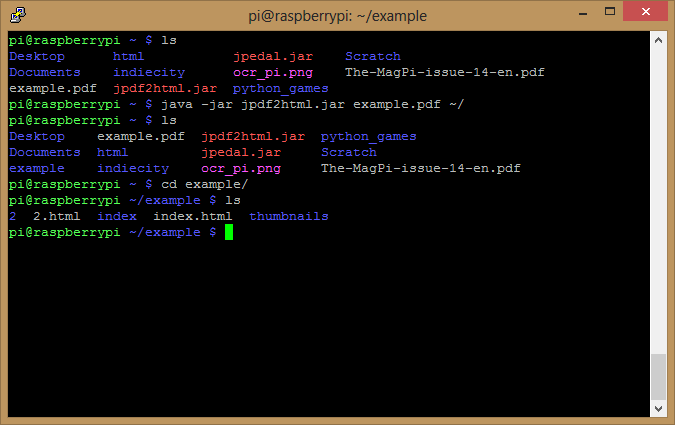 This will unpack the file into your current directory, this may take between a few seconds and minutes on the Pi. Once extracted/unpacked you will be left with a new folder in your current directory named something along the lines of jdk1.8.0 or jdk1.7.0_10. These install and setup the Oracle JDK as the version of java to use on the Pi. 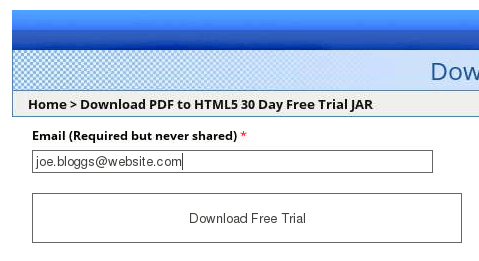 Now that we have the JVM installed we will want to fetch the jpdf2html.jar file, if your a customer you will likely already have it but we do a free 30 day trial jar at http://www.idrsolutions.com/java-pdf-converter/ for those interested and I will be using that during this blog post. The easiest way I find to get the 30 day trial is to start up the the GUI (using the command startx when on the terminal) and open up a web browser to download it through. We require an email for the trial but don’t worry, we don’t give your information to anyone else or spam you. I use IceWeasel (re-branded version of FireFox) on my Pi as a browser when I need some heavy lifting done, but the default ones should suffice. If you ran this without being in a GUI you would of got a similar message in the console. That’s perfectly normal since we didn’t give it any files to convert. Upon clicking Ok (or doing nothing if you are on the terminal) you will then be greeted by a message telling you how long you have left on your trial. Now we have a JVM installed and the pdf2html5 converter jar ready and working it’s time to try it out on some PDF files! I know one that I want to try out on but first we shall try it on a simple test PDF made of two pages to make sure everything works. Again I will use the GUI browser to navigate and download the PDF from their site. (You are welcome to use any PDF I am just using this as an example). This runs the converter with the default settings on example.pdf and places the output in our home directory (inside a subfolder named after the PDF). Again I am using Iceweasel, for reasons that will become apparent soon enough. Now we shall try it on the MagPi magazine and make use of some of the HTML5 features in the library to make it look great. This will take a while on the Pi since the MagPi magazine is quite long and complicated and the Pi only has so much memory and processing power compared to a desktop or server. Once converted you can check the individual pages to see if they are working locally on the Pi but index.html will not work correctly due to it’s use of Ajax so you will need to set up a web server on your Pi to view it from there or put it onto a website. There are a few web servers available and you may already have one installed but I stuck with Lighttpd as it’s lightweight and easy to install and quick to configure. And then reboot the Pi. Now you will be able to add all the HTML files to the /var/www/ directory on the Pi and you will be able to access them from your Pi (and from elsewhere on your network). Because of the Pi’s limited memory and processing power the magazine mode’s page turning may be slightly choppy and will likely only work on a few of the browsers available to it (Chromium and IceWeasel among them). 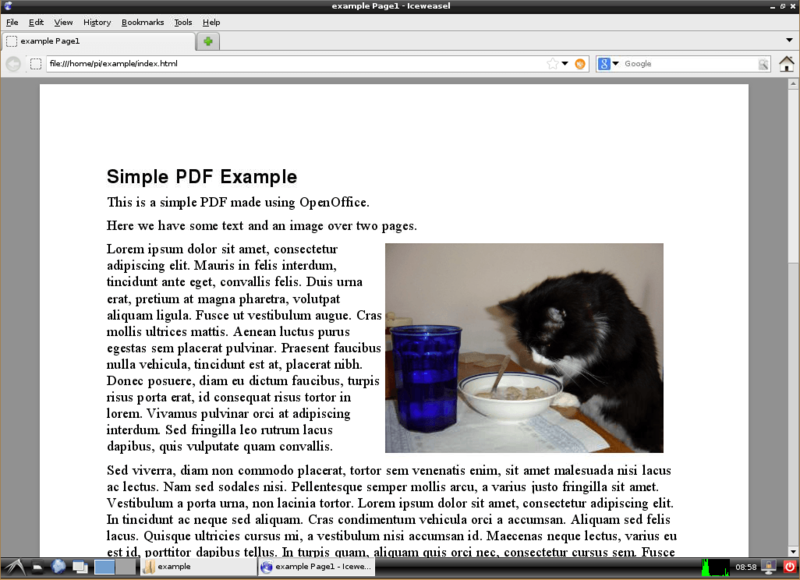 But essentially you have now given your Pi the ability to convert PDF files to HTML5 files! Does your company file reports as PDF? You could write a script to convert those sent to the Pi into HTML so you could view them on your mobile devices. You could convert free E-Books you own to a format that will work on any device with a web browser and have them accessible from anywhere with an internet connection via your Pi. We use our java file with a GlassFish server to provide our Online PDF to HTML converter, now the Pi wouldn’t be able to handle this as well as a dedicated server but it could be useful in a small internal environment, you can install GlassFish on the Pi by install the Oracle Java Embedded Suite which includes it along with other useful Java software. « Why are fonts so complicated? That great! I have had this thought several times but I wasn’t sure if the PI could handle it. Glad to see you were able to get it to work. The Pi team have actually now made it super easy to use the Pi with Noobs and Java is now officially available to download. 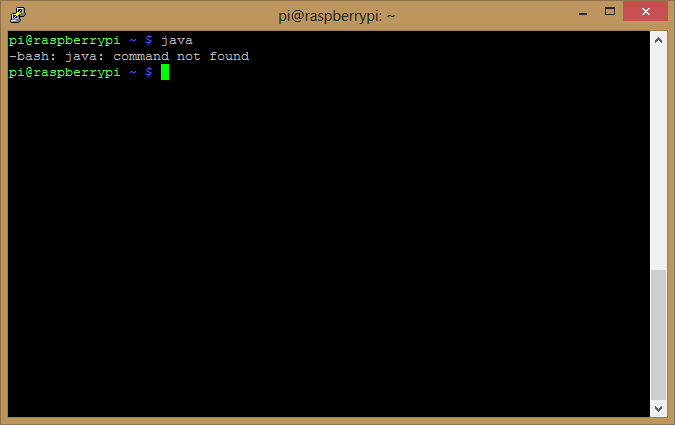 We will try to run some more articles on the Pi and Java in the near future.